Chicago Wedding DJ Entertainment Service dedicated to creating your Wedding in your Vision. Our team of Chicago Wedding DJs will assist with creative wedding ideas that will ensure an unforgettable Wedding. 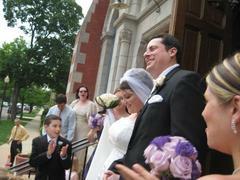 We LOVE to provide wonderful wedding memories for your friends and family. In addition to creative Wedding ideas, we will be your "Wedding Entertainment Director" that allows your wedding to flow smoothly from your first introduction to the last song of the night. Take advantage of our other services such as a Wedding Photo Montage, Wedding Ceremony Services, Wedding Reception Lighting and Wedding Monograms. Best wedding DJ! All of our guests raved about our DJ and the dance floor was full all night long! Music makes the wedding, and I couldn't say more about how wonderful the DJs with S2D2 are!!! Jay (the owner) is truly the best DJ around! He did my friends wedding 2 years ago and now ours. Jay meets with you before your wedding and goes through EVERY detail of the big day. This way when the day arrives, you can just sit back and relax knowing he has everything taken care of!! He not only acts acts as your DJ, but your wedding planner as well. And boy does he do a FABULOUS job at both! He even got out on the dance floor and taught our guests some fun dances. And he wrote a love story about my husband and I and read it to our guests. One of my FAVORITE wedding vendors...book him...you will not be disappointed! They were fantastic - DJ Marc was fun, didn't talk like a sports announcer when announcing songs, and really understood how to read the crowd to keep the party lively. Jay was not only our DJ but also our de facto event coordinator. He worked with us prior to our wedding to plan all the details for the day and because of his attention to detail nothing was out of place.